Election 2016: Lainhard, Milnamow, English, or Auletti for SGA President? You are here: Home » Blog » Election 2016: Lainhard, Milnamow, English, or Auletti for SGA President? August 19, 2016 was “Election Day” for middle school students at Charter Day School in Leland. 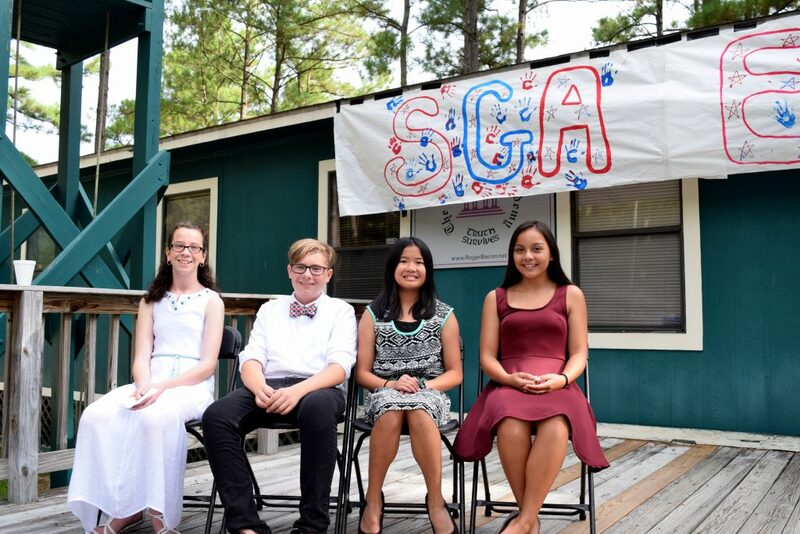 Charter Day School’s Student Government Association (SGA) election process closely mirrors that of our State and Nation in hopes that each student will leave middle school with knowledge of, experience with, and appreciation for political participation and the democratic process. Student candidates campaigned the entire month leading up to the event, with some even selecting campaign “staff” including managers and speech writers. In addition to clever slogans, presidential candidates also had to formulate a researched platform and legitimate plans of action, which they presented in speeches to their peers—approximately 250 students in grades 6-8— at the event. SGA coordinator and 7th grade English teacher, Ms. Erin Brangan, welcomed keynote speaker, Dr. Tom Simmons, a former elected official who served two terms on the City Council for Boiling Springs Lake and who is currently the Director of a nearby charter school, Flemington Academy. After providing candid insights on campaigning and public service to middle school students in his speech, Dr. Simmons spent the morning at the election observing how he might bring a similar event to his school. Charter Day School’s presidential candidates, all 8th graders, impressed with their speeches. 2016 presidential candidates were Madison Lainhard, Seamus Milnamow, Preslee English, and Elizabeth Auletti. The candidates then participated in a live Q&A session with the audience and impressively answered detailed questions regarding their platforms and plans of action. To further involve all students in the democratic process, students waited in line to choose their new SGA slate by private, online voting, even receiving an “I voted today” sticker from volunteer student poll workers.